Dephormation - What did the UK Cabinet and Prime Minister Know about Phorm? Its been almost 2 years, at the time of writing, since the discovery of Phorm's covert trials in the UK. In that time, no regulator has taken action against BT. No police force has investigated. Even the Crown Prosecution Service have been silent. Yet, what BT and Phorm did in 2006, 2007, and even 2008 was clearly illegal. So why no action? In this article I'll attempt to show how and why the former Labour Government, the Labour Cabinet, and even former Prime Ministers, were likely to have been complicit. The trials of Phorm systems span the premiership of both Tony Blair (who was Prime Minister during the 2006 trials), and Gordon Brown (who assumed the office of Prime Minister in June 2007 around the time of the second trial). Assuming for a moment the trials of the Phorm systems were not authorised by Government, the Cabinet Office has four key sources of information that should have alerted them to illegal mass surveillance. The Central Sponsor for Information Assurance, the Communications and Electronic Security Group, the Centre for the Protection of National Infrastructure, as well as intelligence provided by the UK Security Services. The Central Sponsor for Information Assurance (CSIA), also called the Information Security and Assurance (IS&A) unit, is a strategic unit in the UK Cabinet Office. The role of the CSIA is protecting the nation's IT and telecommunications services, in co-ordination with public and private sector organisations (such as British Telecom, and other internet service providers). The CSIA works in partnership with the National Technical Authority for Information Assurance (CESG) and the Centre for Protection of the National Infrastructure (CPNI). "the confidence that information systems will protect the information they carry and will function as they need to, when they need to, under the control of legitimate users." The CSIA co-ordinate with the Home Office, Department for Business, Enterprise and Regulatory Reform (BERR), Serious and Organised Crime Agency e-crime unit (SOCA), and Information Commissioners Office (ICO). During the period when the trials were operating, Britain was under a state of Severe or even Critical security alert. You might expect the covert operation of mass stealth trials of Russian supplied surveillance systems, which corrupted the security and integrity of UK telecommunications, would thus attract the attention of the CSIA. Government Communications Head Quarters (GCHQ) in Cheltenham provide both 'signals intelligence' (SIGINT) and 'information assurance' advice to the UK Government. GCHQ signal intelligence "provide vital information to support Government policy-making and operations in the fields of national security, military operations, law enforcement and economic well being". GCHQ describe their information assurance function as "protecting Government data - communications and information systems - from hackers and other threats". The Communications Electronic Security Group (CESG) is the Information Assurance operation of GCHQ. CESG are the UK Government's National Technical Authority for Information Assurance, and responsible for advising the Government on secure communications. You would hope that GCHQ SIGINT might have detected the operation of unauthorised mass surveillance systems, and CESG would report that fact to the CSIA in the Cabinet Office. The Centre for the Protection of National Infrastructure (CPNI) aims to "reduce the vulnerability of the national infrastructure to terrorism and other threats, keeping the UK's essential services safer". CPNI provide advice to emergency services, energy, finance, food, government, health, transport, water and telecommunications organisations. Mark Hughes is the Director of BT Group Security (appointed in October 2005). His appointment spans the entire period when BT were conducting covert stealth trails of Phorm surveillance systems. He has responsibility for ensuring security and continuity in BT, including "protecting physical, logical, or information assets from attack". Mark Hughes is a member of the Senior Stakeholder Group of the Centre for the Protection of National Infrastructure. Presumably, as a responsible member of the Senior Stakeholder Group, Mark Hughes would have advised the CPNI of BT's intentions? Britain's Security Services (MI5) exist to counter "covertly organised threats to national security", including responsibility for counter-espionage. Their objectives include prevention of "damage to the UK from foreign espionage and other covert foreign state activity". In discharging their function, they liaise with the CPNI. The MI5 web site presently states "hostile foreign activity remains a focus of concern, particularly concerning the activities of the Russian and Chinese intelligence services". Given BT & Phorm were conducting 'unauthorised' covert trials using Russian supplied mass surveillance systems, and engaging in industrial espionage, you'd think MI5 would be very concerned. If trials of Phorm systems were unauthorised, you would expect MI5 to alert the CPNI, CSIA, and the Cabinet Office immediately they were detected. With all these sources of information and intelligence available to the Cabinet, and BT Directors' active participation in those organisations, it is impossible to believe that the Cabinet would have been unaware that covert trials of mass surveillance were proposed by BT in 2006 and 2007. If the Cabinet were aware that BT were planning to conduct trials of mass surveillance systems, and authorised or permitted those trials, they were complicit in an outrageous and illegal mass surveillance scam that exposed the country's economy to industrial espionage, intellectual property theft, and personal security risks. If the Cabinet were unaware, and the trials were unauthorised... why was there been no statement to the UK Parliament by the Home Secretary? No arrests by the police? No prosecutions by the Crown Prosecution Service? No action by regulators? In January 2008 Shriti Vadera was appointed to her first ministerial role as Parliamentary Undersecretary of State for Business and Competitiveness. The ministerial brief included responsibility for the UK's broadband infrastructure, replacing Stephen Timms. 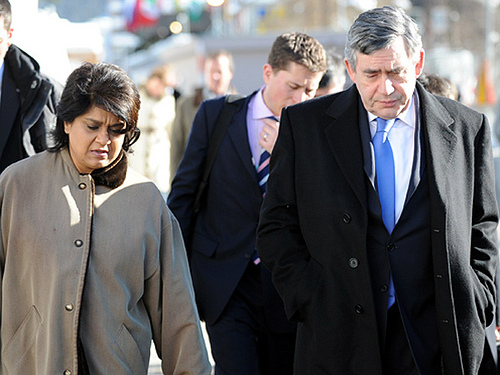 Shriti Vadera is a close ally of Gordon Brown, and worked with him while he was Chancellor of the Exchequer. In an article by Martin Sixsmith for the Sunday Times in 2005, she acquired the nickname "Gordon’s representative on earth"
"I must have looked surprised, because a colleague nudged me and whispered: “Shriti Vadera, from the Treasury: Gordon’s representative on earth.”"
In the Cabinet Office, she was described as Gordon Browns 'Policy Enforcer'. Two weeks after her ministerial appointment, Phorm announced the imminent launch of their Webwise advertising system, and partnership with BT/Virgin/TalkTalk. After the public outcry over the Phorm scandal, there was no statement to Parliament or the House of Lords by Baroness Vadera, though she was the "Broadband Minister". "Do you think we should have any concern that Malcolm says there have been no discussions with BT (which might imply none between BT and BERR) when Shriti and ?? have discussed?" Following the European Commission's intervention, FoI disclosures reveal that Shriti Vadera reviewed and approved the content of the Government's September response to the EC (which was rejected). The final draft was submitted to Shriti Vadera on 1 September 2008. Why was Gordon Brown's enforcer attempting to defend the indefensible? Why weren't details of her contact with BT made public? With all the sources of information available to the Cabinet, the participation of BT in those organisations, the involvement of Gordon Brown's "representative on earth", and the silence of Government Ministers... it seems likely that the Prime Minister's (both Blair and Brown) were well aware of the trials in 2006 and 2007. Given the publicity (including a petition to Number 10 which attracted 25,000 signatures) Gordon Brown would certainly have been aware of the trials in 2008, and informed about the larger trials in 2006 and 2007. Yet the Cabinet Office and Prime Minister's Office have refused to answer any and all Freedom of Information requests concerning Phorm. The inescapable conclusion is that they had something to hide. If so, that something was very sinister and very corrupt indeed.